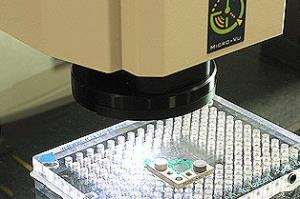 Technology: Inspection Services ensure that manufactured products and systems are adequate for their intended purpose. Inspection is one operational part of quality control, which is the most important factor to the survival of any manufacturing company. Inspections are performed before, during, and after manufacturing to ensure that the quality level of the product is within acceptable design standards. Inspection is the activity of examining the product or its components to determine if they meet the design standards. As it applies to manufacturing, inspection services come in a variety of flavors. Dimensional inspection is most common, applying to many specific products such as bearings and gears. CMM machines, laser scanning, manual inspection are several of the methods employed in dimensional inspecting. Other parts inspection techniques use x-rays to check for voids in critical castings, wall thickness, etc. Still other methods are used to check material hardness, contours, surface finishes, and so on. First article inspection applies to some contracts wherein the very first manufactured part, assembly, etc. is measured very carefully against the drawings with the expectation that if it passes then consecutive pieces will also. Advantages: Inspection Services can be used to evaluate parts, work, etc. independently of the buyer and seller.